Growing up, birthdays have always been a bit of a celebration in my family. A 'Happy Birthday' banner placed on the mantel, often accompanied by a balloon or two, were always a pleasant surprise when we came downstairs on the morning of our special day. And you could never get through the day, let alone the morning, before mom and dad would come into our rooms, with a smile and a hug, singing Happy birthday to you!! Another exciting element of the day was being given the power of choosing our favorite meal to eat on our birthday night. Interestingly enough, even when we were little we, didn't choose chicken nuggets or ice cream or something. My sister often chose Cheeseburger Pie, and my favorite was Chicken in a Basket. (Much to my dismay, they do not create the potato shoestring baskets that made this meal- otherwise this would still be birthday meal of choice.) Coming home from school, the birthday fun would begin with dinner followed by a tasty dessert (also of our choice) and then the fun part, presents!! Sometimes grandpa and grandma would be there to partake in the fun as well. It was really great. And in addition to the birthday fun on the actual birthday, we were given the opportunity to celebrate with our friends in one way or another. I remember several tea parties, probably a few at chuckie cheese, dress up parties, surprise parties in high school, and lots of other memorable moments. My grandpa used to say, "You girls are lucky! Your birthdays go on for weeks!!" Since then, a birthday has not gone by without a celebration in our family. As I prepared for my sister's upcoming birthday last week, my husband commented- 'man, you guys and your birthdays... they're so extravagant!" I never really thought about it that way until he said that. We really have been blessed to build a discipline of celebration around our special days. I know it may sound a bit ridiculous, but I think it fits in perfectly with the mentality of choosing joy. You can either let each day go by without choosing joy or fun, or you can make a point to be happy, and have a blast! I have seen many pictures of huge balloons on wedding pictures, or on various images from my Instagram feed, but never have I seen one in person. I was STOKED when I found out that I was able to get one of these beautiful things at a local party store. I felt like a kid in a candy shop when the clerk presented me with the 36" of pink joyful goodness. :) Clutching the balloon with fear that it might escape my grasp, pushing it through my car door, as well as trying to drive without the balloon bopping around in my sight in my rearview mirror- made getting the balloon home a trip. But the best part of all was surprising my sister. Bright and early on her birthday I decided to grab a few donuts, the balloon, and be at my sister's house before she went to school. And the funnest (yes I said funnest) part was, I didn't just ring her doorbell, instead, I called her and said "Hey, can you do me a favor? Can you look outside for a second?" A little confused, she peeked out her bedroom window and saw me standing there in her driveway with the huge balloon. She was ecstatic, she kept giggling over the phone and said oh my gosh, oh my gosh, that balloon is huge! Before heading off to school I took a picture of her (image above) and her "balloon buddy" as we referred to it for the rest of the day. 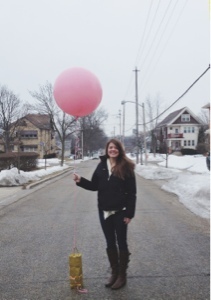 It was so so fun to bring joy to my sister and celebrate her in a way as random as giving her a big balloon. [And it was also a ton of fun to make her lug that balloon around everywhere with her for the rest of the evening... I called the photos "Steph and her balloon parts 1, 2, 3, and 4" see images below] She means the world to me- she's my best friend. 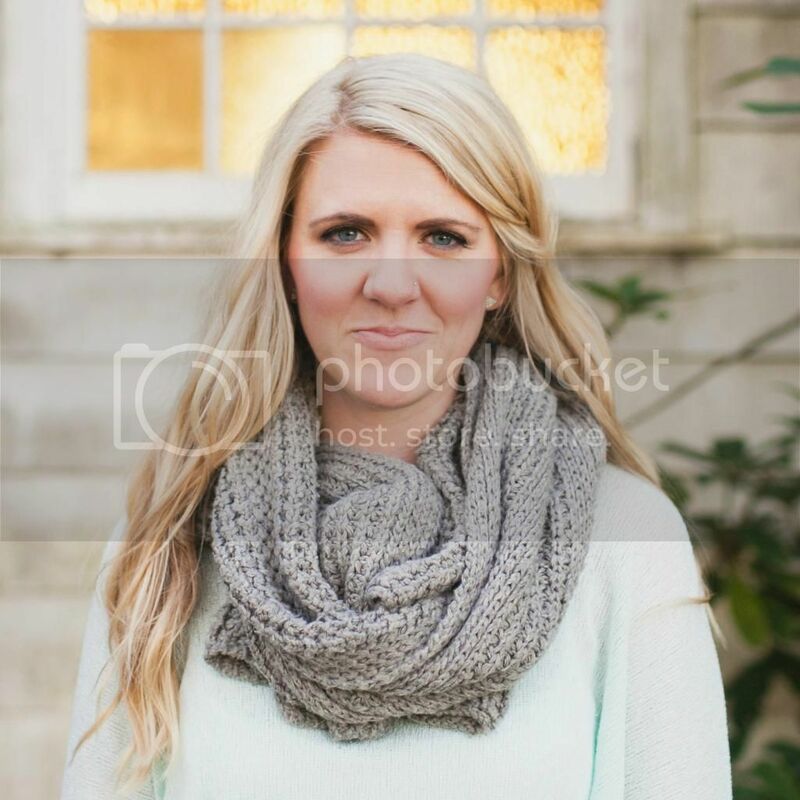 Such a loving, caring, beautiful, encouraging woman, who I could not live without. I am so blessed to have her in my life, and so thankful to have the opportunity to bring her joy. So, cheers to the little things in life that make people happy, like huge balloons. My hope is that this week, you might take the time to celebrate those you love, and find joy in the small things. Copyright 2008-2015 lovemin. Powered by Blogger.